Home invasions are carried out mostly at night and on weekends when there is a greater chance that the occupant(s) will be at home. Women living alone, senior citizens and business owners that are known to carry home money or valuables are prime targets for this kind of crime. The more sadistic criminals target people based on their looks and are considered more dangerous because they are after much more than just valuables. The best defense against home burglaries or invastions is education, planning, and implementation. Listed below are basic home safety tips to better protect and prepare yourself for this danger. Change the locks when moving to a new home or when a tenant moves out. If you live alone, have a male friend or relative record your voice message on your answering machine. Trim down bushes and trees blocking any doors and windows of your house. Also, keep the exterior of your home well lit. Equip all doors and windows with good locking devices. All doors that enter your home should be equipped with easy to use deadbolts and door jams. Large sliding doors are particularly vulnerable to being forced open or lifted off their track and should be fitted with a special bolt or pin lock. For best security, keep all doors and windows locked. Install peepholes in doors without windows that enter and exit your home. If you have children, install a second peephole about eye height for them. If affordable, install a video-equipped intercom system. Make it a habit to look through the peephole or video intercom before opening the door. 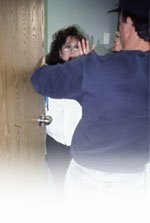 When doors are locked, you should have an easy way to see and communicate with the person on the other side. Do not rely on the security provided by most automatic garage doors that do not have a locking system. Predators can easily rollup most automatic garage doors. It is also a good idea to get a motion alarm that sounds a loud siren when activated for garages and sheds. Install an exterior perimeter alert alarm system around your house, as well as an interior alarm system. If possible, have the systems equipped with cameras and an auto-dialer. An interior alarm system can startle the intruder, and, hopefully, derail their plan. If your system is equipped with an auto dialer, it could dispatch help to your home right away. It can also provide you with an early warning that your home has been compromised and gives you a better chance to protect your family, escape, hide or fight back. Build a designated safe room in your house, equipped with a door jam, a cell phone charger, and emergency numbers including police and fire, as well as trusted friends and neighbors that live nearby. Your first call in an emergency should be to 9-1-1, and remember not to hang up until they tell you to. Another good idea is to have the main control system for external and internal alarm sirens accessible in your safe room so you can activate them in an emergency. Have emergency phone numbers to police, fire and poison control by every phone in the house. Get good quality smoke and fire detectors and position them on every level of yoru home and work place. Use the highest performaning batteries in your smoke and fire detectors and change batteries at least three times a year. User timers to turn on your lights, radio and television. This way, you do not come home to a dark house. To an observer, your home will appear occupied. Draw window shades and drapes when there is a need to turn on lights inside your home. Observers outside can easily see in your home when it is dark outside and there are lights on inside. Get a dog. It doesn't necessarily have to be an attack dog, but one that barks and alerts you to trouble. Avoid putting your name on your mailbox or home. For women living alone, do not publish your first name in the phonebook or online. Instead, use initials or a ficticious name commonly associated with a male. Never announce that you are home alone. Do not allow anyone that you are unfamiliar with into your home. If you have called for a repairman, ask the company how he can be identified. When the repairman arrives at your door, have him slip identification under the door for you to check. If you order a food delivery, have the exact amount for the purchase ready and complete the transaction on the porch on in the hallway. When arriving at or leaving your home, work place, or vehicle, always have the key you will be using next ready to go. If you return home and find doors and windows have been tampered with, do not enter! Instead, go to a neighbor's and call the police. Never give directions to your home to a stranger or in the presence of a stranger. Never give any other key than the ignition key when having your car serviced or valet parked. Also, lock your trunk and glove box and remove any valuables or papers with your name, address or any other private information on them.